Blue Star Highways across the United States pay tribute to members of the United States armed forces. Blue stars can be found on service flags, which emerged as banners hung in windows during World War I to indicate that a member of that household was in the military. A gold star flag indicates that a member of that household died in military service; Connecticut also honors gold star families on license plates. In 1945, in the aftermath of World War II, the National Council of State Garden Clubs (now known as National Garden Clubs, Inc.), began marking highways to honor members of the military. The National Council of State Garden Clubs was established in 1929; today, the National Garden Clubs, Inc. has over 5,000 member garden clubs, comprised of over 165,000 individuals. There are at least 193 Blue Star Highways in the United States; of these eighty are in Louisiana, the most – by far – of any state. Connecticut has seventeen Blue Star Highways. The first, along Route 1 in Guilford, was dedicated in 1950. It wasn’t until 2003 when Exit 5 off of I-84 in Danbury became the state’s second Blue Star Highway. This marker, along Route 317 in Roxbury, is Connecticut’s second newest, dedicated by the Roxbury-Bridgewater Garden Club in 2018. Two days later, the Black Rock Garden Club of Bridgeport denoted a walkway in the St. Mary’s by the Sea park the state’s newest Blue Star Highway. Many of the trails that wind through the White Memorial Conservation Center were originally constructed as carriage roads for Alain and May White. Great care was taken in building this network of roads, as evidenced by the many extant bridges, culverts, and drainage ditches. Carriage rides on roads carved out of forests was a popular leisure activity for wealthy Americans in the late 19th and early 20th century. The Rockefellers, for example, built 45 miles of carriage roads at Kykuit, their Tarrytown, New York, estate, eighteen miles or roads at their Forest Hill, Ohio, estate, and 57 miles in what is now Acadia National Park in Maine. Alain White oversaw the construction of dozens of miles of roads at Whitehall, what is now White Memorial. From the 1870 carriage house, the Whites would drive their team of horses around their property. Approximately four miles from their home was Beaver Pond. High above the pond they constructed a pull off so that they could admire the vista from their carriage. And on the shore of the pond, White built a Japanese tea house. Here Alain and May could entertain friends before returning back home. Wealthy Americans of this period were captivated by paintings by the likes of Frederic Church and Winslow Homer of the American wilderness and looked to have their own experiences in nature. And if that could be done by constructing a Japanese tea house on ground seemingly untouched by human hands, so much the better. At about the same time, Robert Pruyn, an Albany banker and businessman, constructed an entire estate with a Japanese theme on nearly 100,000 of Adirondack wilderness in Newcomb, New York. If on a smaller scale, Alain and May White were inspired by similar ideas in Litchfield and Morris. Henry E. Cattey, who is often listed as being from the “Marsh District” of Northfield, but sometimes listed as being from Thomaston. He was a mechanic in Company I of the Sixth Infantry, and was killed in October 1918 while liberating the French town of Bois des Rappes in the first phase of the Meuse-Argonnes Offensive. Roy F. Cornwell, who enlisted as a member of the New York State Militia from his father’s residence in Ellenville, but had lived in Litchfield for some time. He died on the ship en route to France. Clayton Devines died of the Spanish Flu in November 1918 while at an army camp in Florida. Between 50 and 100 million people worldwide died of the epidemic. Joseph Donohue – hometown unknown – was a student at the Connecticut Junior Republic who enlisted in the army and died in action on July 23, 1918, during a French and Americans advance on the Ourcq River. August Guinchi of the 56th Regiment Coast Artillery was gassed was driving a tank. In a weakened condition, he succumbed to typhoid fever October 31, 1918. Robert Jeffries died of pneumonia on January 20, 2018, at Camp Gordon, Florida. 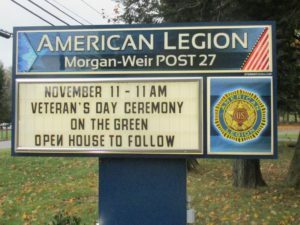 Litchfield’s Morgan-Weir American Legion Post is named for Frank A. Morgan and James V. Weir, both of whom died in combat in World War I.
Howard C. Sherry died of pneumonia on January 16, 1918, at Camp Johnston, Florida. James V. Weir served in the 102nd Regiment alongside his brother, Thomas. Thomas provided the following account of his brother’s death at the Battle of Chateu Thierry: “At the start of the Chateau Thierry drive they went over the top at 5:30 A.M. and went into woods the other side of the starting position. They relieved the Marines, with Marines on left and French on right; the position was in a horse shoe. The company went ahead and had to wait for the French. They went back and went ahead again without barrage. Co. H. was in the 2nd batallion. Enemy artillery fire was very heavy, 2nd battalion in support, 3rd battalion ahead and 1st in reserve. The company was in open field kneeling down in close formation, a German big shell came over and landed 200 yards away. A piece landed beside the two Weir boys and hit James between the eyes. Roy Hotchkiss helped to carry out and bandage James, who was taken to the 103rd Field Hospital at La Ferte and buried there”. Of Pio Zavotti, little is known except that he was born in Italy and was killed in action fighting for his adopted country. The earliest Catholics to arrive in Litchfield were Acadians, French inhabitants of eastern Canada expelled from their homeland by the British in 1755 during the French and Indian War. Technically prisoners of the British, over 11,000 were dispersed among Britain’s American colonies. In 1759, the town of Litchfield authorized that its selectmen “may provide a house or some suitable place in the town, for the maintenance of the French.” There is little evidence of the presence of other Catholics in town until 1848, when Rev. John Smith, a visiting missionary, said the first recorded mass in Litchfield. It was noted that the second mass held in town was at the home of John Ryan on the west side of North Lake Street by Rev. Philip Gillick in 1853. There were twenty in attendance, and in the same year Gillick performed Litchfield’s first Catholic marriage. In 1858, Julia Beers purchased a small house on South Street (that still forms part of the rectory) for use as a church. An altar was set up in the dining room and masses were said there until 1861 when increasing numbers necessitated a move to the courthouse. Between 1861 and 1882, pastors from Winsted – beginning with Reverend Daniel Mullen – also officiated at the Litchfield church. In 1882, Rev. M. Byrne became the town’s first resident priest. A new church – shown above from an early 20th century postcard – was erected between 1885 and 1889 at a cost of $23,000. This was an ornate Gothic Revival structure, with buttresses and stained glass windows. In 1890, the parish’s Knights of Columbus chapter began, and in 1907 the Emma Deming Council No. 265 Catholic Women’s Benevolent Legion started. As a sign of the church becoming an established institution in the town, the St. Anthony’s service flag was prominently featured in Litchfield’s 1918 Armistice Day parade. A massive fire destroyed the church on October 5, 1944. Masses were held at the Congregational and Methodist churches for the next four years while a new structure was completed. With World War II raging, building materials were harder to come by, eliminating stained glass windows from the plan. A simpler design was the result, as seen in the postcard above. The steeple and passageway to the rectory were added in later years, but at the back of the church is the cornerstone from the 1887 structure, salvaged from the ruins of the fire. 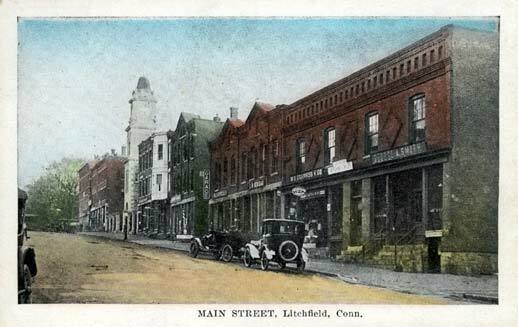 It’s been well documented that Litchfield, as much as any other town, is a shining example of the Colonial Revival. In the late 19th and early 20th century, Litchfield residents remade their town from one that featured many Victorian homes (with a few structures remaining from the Colonial Era) to an embodiment of Colonial architecture, with many homes painted in the classic white-with-black-shutters look. Many such holes and old stone posts are visible around town, reminders of the fact that the historic Colonial appearance of Litchfield was carefully crafted over decades, more than a hundred years removed from the Colonial Era. Litchfield’s Congregational Church has been called “the most photographed church in New England.” It’s Greek Revival design and the simplicity of its black shutters and white paint seemingly epitomize colonial architecture. Its style is a perfect match to its setting. Except that this is both Litchfield’s third and fifth Congregational Church, a story partly illuminated by this cornerstone. The first Congregational Church was erected between 1723 and 1726 in the intersection of the town’s major north/south and east/west roads, where today we would find the green. A largely square structure, it was sold in 1761 and the larger second Congregational Church was erected the following year. By 1828, the church building had deteriorated so badly that one anonymous writer to the Litchfield County Post commented, “the shabby building pains the eye of every stranger.” The structure’s dilapidated condition – coupled with their era’s surge in desire to separate church and state, as manifested in Connecticut’s 1818 constitution – led to a decision to build a new Congregational Church off the green. It is the construction of this church that is commemorated by the “1829” on the cornerstone. For its popularity and the rave architectural reviews the structure draws today, its design fell out of favor in the post-Civil War era. Of the building, Henry Ward Beecher, who had grown up in Litchfield, remarked “There is not a single line or feature in the old building suggesting taste or beauty.” With the popularity of Gothic Revival architecture, the third church was moved down the Torrington Road in 1873 and replaced by a wooden structure with dark stained glass windows and dark paneling and furniture, representative of the Victorian era. The third church served as a gym, a roller skating rink, concert and dance hall, and movie theater, until the Colonial Revival swept the nation in the 1920s. At that time, Edgar Van Winkle, chairman of the Congregational Church’s building committee, termed the fourth church a “monstrosity” and, in 1929, hired noted architect Richard Henry Dana, Jr., to develop plans to move the third church back to a site opposite the green and restore it to its Greek Revival splendor (if not to its exact appearance, as several details were changed). This restoration is commemorated by the “1929” on the cornerstone. The Congregational Church is an iconic symbol of Litchfield, but its foundation highlights the fact that this was not always the case. For more on the architectural history of Litchfield’s Congregational Church, see Rachel Carley’s excellent book Litchfield: The Making of a New England Town (2011). The Litchfield Court House ceased operations in August 2017 after operating in town since the 1750s and in the same building since it was constructed after the fire of 1886. The Greater Litchfield Preservation Trust, which recently purchased the building, held an open house for a glimpse inside the historic structure. A fireplace in one of the offices. Entrance to the large law library on the second floor.